Much has happened since I've written a blog post on this site. After a fantastic trip to France and Italy last fall ( https://fabamoeuropa15.wordpress.com/ ) including an amazing workshop in Ravenna at KokoMosaico, it was time to get serious about our move to Bend. The reality set in that I was going to have to take a hiatus from making art, and in fact re-think what my professional life would be going forward. As I said in an earlier post, being an artist, I will never be officially "retired." Yet I needed to redefine how my life is structured. What with moving to a new city and living with a retired husband, a whole new life is unfolding! Our move from Hillsboro to Bend is requiring serious downsizing. The biggest issue is leaving a 400 sq. ft. studio. We have plans to build a free-standing studio in our yard, but at best it won't be complete until much later this year. In the mean time, we have a small room in the house that we are using as a temporary studio, but the majority of the "stuff" is going to have to be stored. Therefore, where do I want my creative live to take me in the interim? My friend Scott gave me a great tip to follow during this time: while you can't actually make art, keep those ideas that are swirling around your head coming, and put them down in a sketch book, words and pictures. And when the time is right, the creation of the art will flow. So that's my plan. And in the meantime, I embarked on a brand new creative outlet. One that produced a functional piece of art. 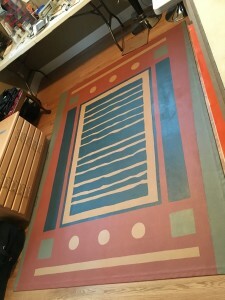 I painted a canvas floorcloth! For our little interim studio in Bend, a converted bedroom, we had hardwood floors installed this summer. It needs to be protected from flying shards of stone and glass, as well as printing ink when Bob fires up his etching press. I got the idea of floorcloths from my friend Joyce, who had created them many years ago, and they are still serving her well and beautifully, 30 years after she painted them. I discovered an important thing: trying out new art forms, new ways to express creativity in addition to one's primary medium, is an excellent thing to do. I discovered I actually enjoyed painting! And I thought I hated it. 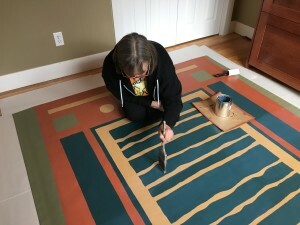 Well, I doubt I'll ever truly love painting rooms, but creating the floor cloth was a lot of fun!